"I love Dorje Shugden and I love his hat. We did not have much to go on in 1956 and I was eight, except for a Smokey The Bear, Teddy Bear. A Forest Ranger with a hat just like the Protectors,he carried a shovel and said, “Only you can prevent Forest Fire. I loved that Bear very much. He taught me to love the Forest, he wore a hat that had authority. Smokey taught me to put out fires, Like the one we fight today. This immense flame scorches the earth, The Dharma proceeds unhindered, by insignificant attempts to put it out, Is immeasurably insignificant. As a fire sweeps through the underbrush to clear out the old, new seeds and sprouts emerge with new blooms. So too the dharma starts anew with each one of us, renewing ourselves within the purifying blaze, that burns brightly within each and everyone of us. 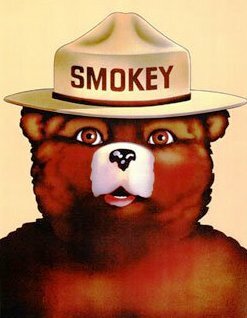 I loved Smokey The Bear! He was always there. I love the Protector! He is always here." So sweet. Smokey the Bear and Shugden on such pedestals, both imaginary saviors. Contrary to Shugden, however, Smokey the Bear was never used to hurt or demean anyone. Contrary to Shugden, Smokey the Bear never needed protection. Contrary to Shugden, Smokey the Bear never served as chief god for a cult and reason to protest and ridicule others. Although this NKTite sees them as related, I prefer Smokey the Bear. How about you? Smokey, please forgive me. 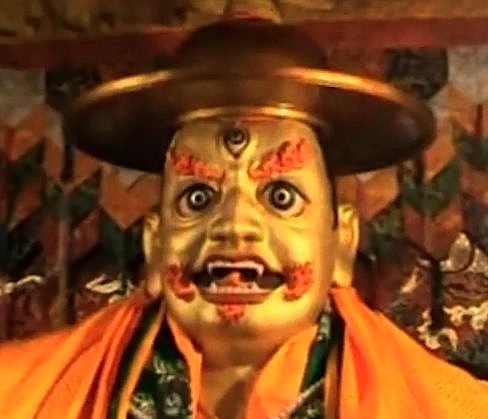 Maybe Shugden has a better hat. Maybe three eyes are better than two. But, you have a better mission. Let's remain friends, OK?